We aren’t surprised that Former President Bill Clinton confessed that one of his favorite sandwiches is peanut butter and banana; peanut butter and jelly are also reported to have been the favorite of Elvis “the King” Presley. Peanut Butter Lovers need not look further than Delightful Pastries to indulge in their favorite spread this November. 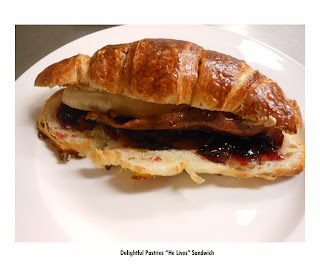 The “He Lives” Sandwich ($8.25) is a must starter with Peanut Butter, Grape Jelly, Lean Crispy Bacon, Banana and a secret house sauce on a house made all-butter croissant, $8.25. Follow that with a Triple Decker Peanut Butter Brownie ($3.50), Peanut Butter Mini Pie ($5.25) or a Peanut Butter Chocolate Cupcake ($3).